The annual one-day event features musicians performing in and among Oakland's extraordinary monuments, mausoleums and renowned gardens. 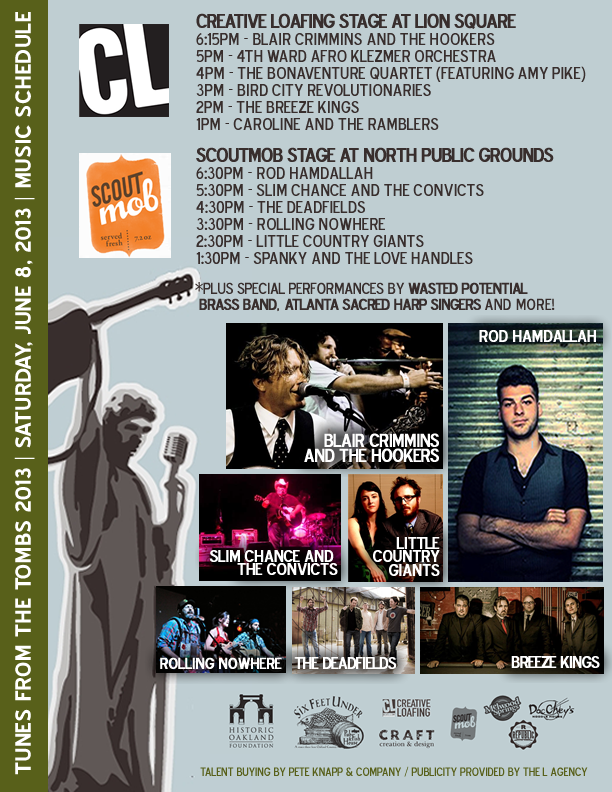 Several picturesque main stages host amplified artists, while buskers perform on vignette stages throughout the cemetery park. TUNES FROM THE TOMBS features musicians from Atlanta and beyond. 100% of proceeds go toward operations of the Historic Oakland Foundation. Call 404.688.2107 for more info. Map to Oakland Cemetery. This year's line-up includes performances by Blair Crimmins and the Hookers, Old 4th Ward Afro-Klezmer Orchestra, Bird City Revolutionaries, The Bonaventure Quartet (featuring Amy Pike), Caroline and the Ramblers, Slim Chance and the Convicts, Rolling Nowhere, Little Country Giants, Wasted Potential Brass Band, and more! To soothe your spirits, TUNES FROM THE TOMBS will have plenty of beer and wine. Local Atlanta food trucks will be serving a variety of tasty festival fare. Festival attendees can also take a complimentary guided mini-tour, or have their fortunes read by Atlanta’s own, Robyn Avalon. Bring a blanket or a lawn chair. No coolers or outside food allowed. Dogs are not allowed due to Atlanta City ordinance. 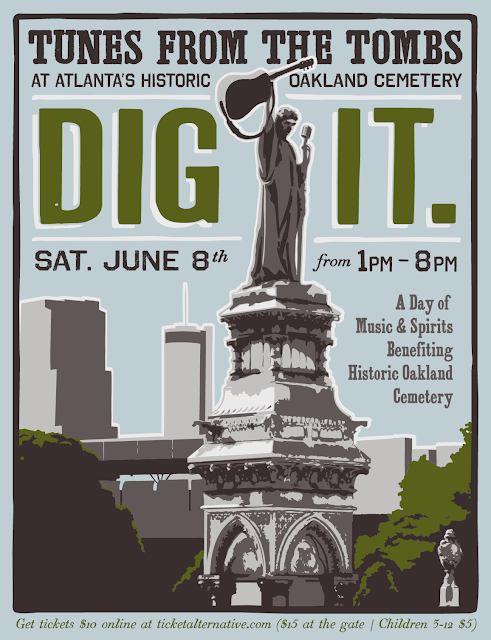 Parking is $5 at the Grady Health Systems Parking Lot located behind the King Memorial MARTA station on Grant Street, and in the Oakland Cemetery Parking Lot . In keeping with Historic Oakland Foundation’s green initiative, festival attendees are encouraged to ride MARTA to the King Memorial Station. All proceeds benefit Historic Oakland Foundation. The work of the Foundation is supported by grants from charitable foundations, individuals and events like TUNES FROM THE TOMBS. 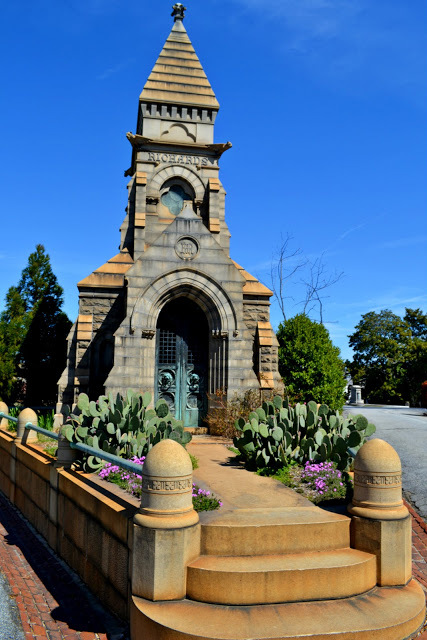 Oakland Cemetery has given us two tickets to give away to one of our readers. To win tickets for Tunes From the Tombs all you have to do is leave us a message and register your entry using our Rafflecopter widget.